'Oast houses' were generally large roomy buildings with a forced heated air stream often powered and heated by steam engines, to dry the hops grown throughout the Derwent Valley for beer production. Wealthier owners built their oast houses of brick, others used timber – and a number of these timber constructions have been claimed by time and fires. They were built adjoining the fertile river flats where hops thrived , protected from the wind by rows of poplars planted around the hopfields. Hop growing expertise was brought to Tasmania in the mid to late 1800s and particularly from Kent in England, where hops were widely grown. My article (below) was published in 'Australian Coast and Country' and later in 'Country Life' in the UK. It offers some insights into the origin and purpose of these buildings in our landscape, and the fascinating history that surrounds them. Twenty miles north along the river Derwent from Tasmania’s capital, Hobart, lies the township of New Norfolk, so named by founding settlers from Norfolk Island relocated there in 1803. New Norfolk and its alluvial river flats were to become the centre of a thriving hop industry strongly coloured by its English architectural and cultural roots. Looking north from the heights of Collins Cap in southern Tasmania on a bright morning, and high above the rural township of New Norfolk, the Derwent River’s course towards Hobart is often marked by pockets of mist that lie in the valley below. From eagle-height, angled borders of enormous Lombardy poplars protect a patchwork of rich alluvial river flats that nurtured the hops once grown there in such abundance. And beside many of these clearings, close to a meandering but now silent railway track, a series of tall sentinel-like structures still stands close to the river. 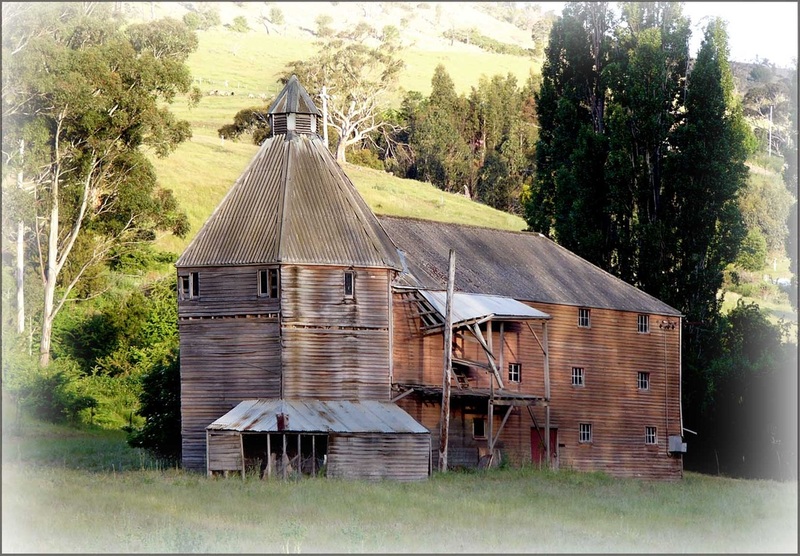 Some of brick, but many of timber – unimaginable acres of milled, horizontally lapped hardwood weatherboards hewn from local forests in years gone by – these are the remaining oast houses, the drying kilns of this valley’s most famous product. Here families seasonally worked the hop vines from dawn till dusk to bring in for drying the rich harvest yielding a world class ingredient to flavour the brewing industry’s liquid gold. Tasmania’s hop industry began in earnest when immigrants newly arrived from England recognised in the Derwent Valley conditions that characterised the flourishing hop farms of Kent and Sussex – flat land, deep soil and ample water. Poplar cuttings were struck and planted to form windbreaks. Tied to bush poles with reeds gathered from the marshes, the hop vines thrived. Hop harvesting is like hay making; you do it when the sun shines – quickly. Hops had to be stripped from the vines and dried to preserve them. Sunlight was no good for drying because it could spoil their colour. Warm air was needed – and lots of it. Good harvests could be colossal; a successful harvest promised prosperity but the process had to move quickly. Van Diemen’s Land was a young colony and its appetite for beer encouraged hop production, as did its ideal growing climate. The demand for land to produce hops grew quickly. Enterprising farmers, auger at the ready, would go up-river under cover of darkness to test the soil depth of prospective hop fields and try to outflank their competitors. Often prospective buyers of hop land used dummy bidders at auctions to keep the price down by confusing rival bidders. Every hop farm needed an oast house for drying its harvest and many beginners built just a basic centre-pole timber shelter. Those taking a longer view built more sturdily, baking their own bricks, as was done at Valleyfield, Bushy Park and Redlands. Some growers built cavernous multi-storey structures with mechanical loaders to lift the tons of hops up to levels where they could be spread for air-drying by massive steam-powered fans. Shingled roofs were the order of the day and shingle-splitters were much in demand. Timber was plentiful; huge eucalypt forests bordered the river and there was plenty of work for millers and pit sawyers. Whether of timber or brick, the formula was the same: space to dry, space to store. The air had to move, or the hops would go mouldy. Oast house floors were open-slatted to let the drying air circulate; windows were costly and therefore just big enough to let in sufficient light to work by. Yeoman farmer William Shoobridge left Kent in 1822 with wife and eight children to settle in Van Diemen’s Land, bringing with him cuttings and seed to continue as a hop-grower in his new home. Tragically, three of his family died at sea: wife Mary, in childbirth, and two young children. Despite such adversity William persevered, and his steadfastness was not lost on his son, Ebenezer, who built on his father’s skills and determination. Overcoming slow beginnings, in 1849 Ebenezer took the opportunity to lease Turriff Lodge, the Government Farm at New Norfolk, and introduce a new hop variety to the island. But by 1852 he had moved on and acquired the Valleyfield homestead just north of the township. From there he made frequent trips further along the Derwent to Bushy Park, where his innate business sense drew him to buy a lowly regarded flood plain he and his son Robert had discovered near the junction of the Styx and Derwent rivers. Ebenezer’s eldest son, William, dubbed ‘Water Willy’ because of his passion for hydraulics and irrigation, engineered the removal of a logjam responsible for constant flooding at the confluence of the two rivers. This allowed the Styx to return to its original course and flow freely again. To complete the transformation, William built a dam some 5 km upstream and an 8-tonne water wheel, still standing at the Waterwheel Kiln, to feed an irrigation pond at his new Bushy Park property. Ebenezer and Robert dedicated themselves to the construction of brick kilns and sawpits on their new property and in 1867 completed the family’s famous Text Kiln, proudly inscribed, “Erected by Ebenezer Shoobridge, 1867, assisted by his wife and three sons and five daughters. Union is Strength.” Still standing, the Text Kiln derives its name from the wall-mounted biblical texts which Shoobridge, a deeply religious man, enshrined there as an inspiration to his workers. 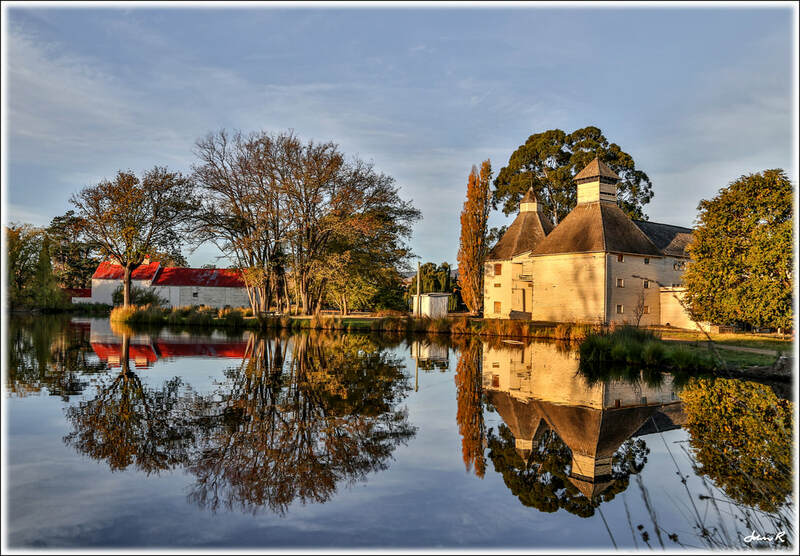 The Bushy Park complex remains the jewel in the crown of southern Tasmania’s oast houses. Apart from the Text Kiln, numerous other large timber structures within the picturesque complex remain historically intact and are well maintained. Whether in morning mist or late afternoon sun, this collection of buildings remains a favourite with visitors, artists and photographers. A picnic by the pond in the unspoiled surroundings is like stepping into another time. ​From New Norfolk, a twenty-five mile circuit follows a scenic oast house trail. The oast house just outside the township at Tynwald Park is now the Oast House restaurant and museum featuring the history of hop growing in the area. A rustic timber building, it looks across to a pair of oast towers, all that remains of Lieutenant-Governor Davey’s retreat on the farm leased by Shoobridge in 1849. This complex fell on hard times after Shoobridge’s tenancy and was purchased by Alexander Riddoch, who renamed the property Turriff Lodge after his Scottish home thirty miles from Aberdeen. Turriff Lodge was compulsorily acquired by the government towards the end of the Second World War but then fell into total disrepair, was vandalised and eventually bulldozed. The two remaining double-storey hop kilns built of local stone and brick and connected by a timber annexe were eventually converted into a private dwelling, ensuring their survival. ​​Time can take its toll, and although size is no guarantee of longevity for oast houses, it is mostly the larger complexes that have been best maintained. Where hundreds of minor examples have disappeared through fire or decay, the larger ones have been better protected. Two such gems in excellent condition, including a massive round tower of red brick, nestle safely at Valleyfield Estate and Glen Derwent behind white-flowering hawthorn hedges bordering the Lyell Highway, a short walk north of New Norfolk. This is ‘early Shoobridge’ country; Valleyfield was a staging point for the family as their interests progressed north, and later became Robert’s home. Its oast house is a massive round tower of red brick with a shingled roof, built in 1884 in the Kentish style. Adjacent buildings include the original homestead – a converted inn – a coach house, and the stone prison common in settlements in the young convict colony. A few miles further on at Rosegarland an enormous timber oast house dating from the 1870s breathed new life as a family home with the addition of windows and balconies, until it was totally destroyed by fire. Two more pioneering monuments of the hop industry rise up like monoliths just off the Glenora Road at Plenty. Once competitive neighbours in hop production, Redlands and Glenleith have stood toe-to-toe for many years. In 1822 Redlands Estate of 1550 acres was granted to George Frederick Read, who built a magnificent homestead and oast house complex of bricks produced on the property. The workers’ quarters still stand impressively, complete with bakehouse and what was once a general store. Even a belltower and cobbled yard remain. Set among huge oaks and poplars, it continues to offer tourist accommodation with a close-up view of what was once a thriving village-style complex. Set on one thousand acres, Redlands’ neighbour, Glenleith, boasts a huge timber oast house complete with hexagonal twin towers. Like its neighbour it has seen far better times, but maintains a defiance and dignity typical of these statuesque constructions. But while Redlands continues to generate business, buildings such as Glenleith’s now pose a dilemma for their owners. Unable to justify the enormous cost of restoring or even maintaining them, their advanced state of decay also prevents a return being derived from them, while the threat of fire is ​of constant concern. 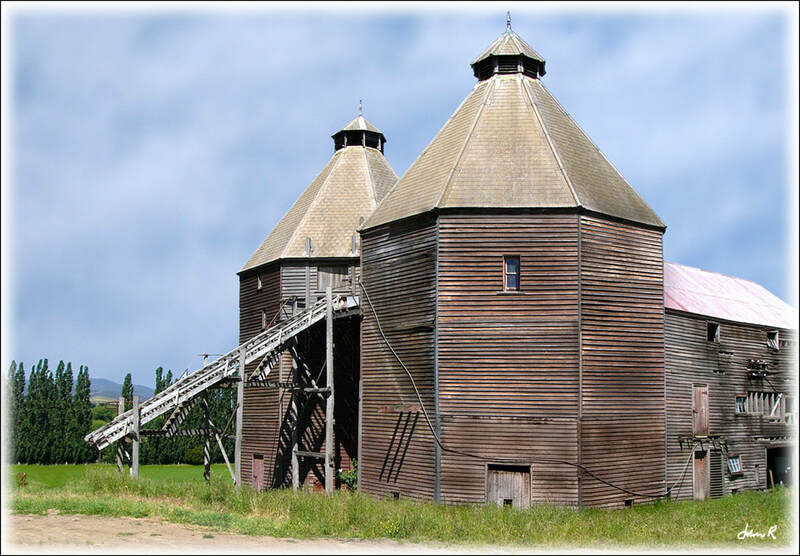 In the hamlet of Ellendale, the telltale vented top of a minor oast house is a nudge and a wink from the past. Better awaits the visitor towards the beautiful Meadowbank dam. 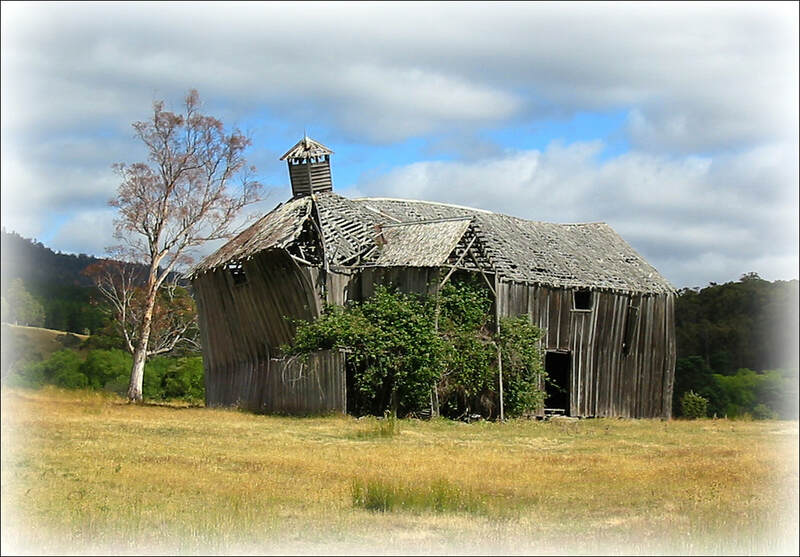 An old favourite – I call it "Tumbledown", in a state of collapse, but packed with character – stands by the road some eight miles past Ellendale. Its small twisted tower doesn’t seem long for this world. (It has fallen down since this article was published). South of New Norfolk, a few miles towards Molesworth and nestled below the slopes of Collins Cap, The Hermitage is a unique example of a homestead and oast house in a single structure. Along with its numerous outbuildings it is currently being restored. Salt of the earth octogenarian Jim Mollineaux who still lives on the property began his association with The Hermitage half a century ago, stringing hops, and making the farm his home and his life’s work. Nearby along the Glen Dhu road another oast house is being converted to a family home. Further on, pickers’ huts, dating from days when schools released children to go hop picking with their families, huddle among the hawthorns. Ebenezer Shoobridge is buried in the Red Hills cemetery where his monument stands sturdy and tall, overlooking his Bushy Park creation. Here too stands the memorial to the wife and children he lost at sea. As season follows season and serenity reigns in the valley, the old oast houses, a little softer in their shadings and a little closer to the earth than they were the season just gone, stand as witness to their creator’s pride and to times gone by.